March 2019: Systemic administration of SPION magnetic nanoparticles functionalised with multimmune’s recombinant human Granzyme B (mi-APO) which targets cancers expressing membrane Hsp70 (GrB-SPIONs) enables MRI imaging of tumours and enhances overall survival in pre-clinical models of aggressive brain cancer (glioblastoma multiforme), lung cancer and metastatic lung cancer. Click HERE for more information. February 2019: multimmune's autologous NK cell therapy (ENKASTIMev) followed by second-line PD-1 inhibition delivers long-term disease control in patient with lung cancer - click HERE for more information. multimmune GmbH is a private, clinical-stage biopharmaceutical company which has developed a unique and proprietary technology platform for the development and clinical delivery of new cancer therapies on the basis of the founding scientists' (Professor Gabriele Multhoff, Dr Claus Botzler) discovery that cell surface-bound Hsp70 is uniquely expressed on a large proportion of cancers (~50-75%), but not on healthy cells. 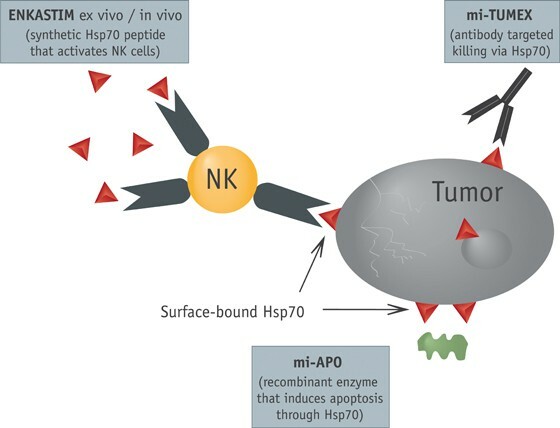 This makes this form of Hsp70 an excellent and broadly-applicable molecule on which to base the development of broadly applicable, innovative cancer diagnostics and therapeutics (theranostics). The fact that the membrane form of Hsp70 is expressed on a large proportion of cancers means that a single therapeutic approach will be applicable across a range of cancer types.